While the stores are prepping for fall, we’ve had some record high scorchers in New York. As much as I love autumn, it’s hard to get in the fall state of mind when you’re sweating bullets. Ugh. September can get here soon enough in my book! The most I can do is embrace the little bit of summer we have left and have a little fun with it. That’s why I’m loving this pineapple embellished top from Lane Bryant. It’s cheery and playful with the cute pineapple graphics and metallic accents, but the stripes is what sold me on it. What can I say, I love a striped tee. 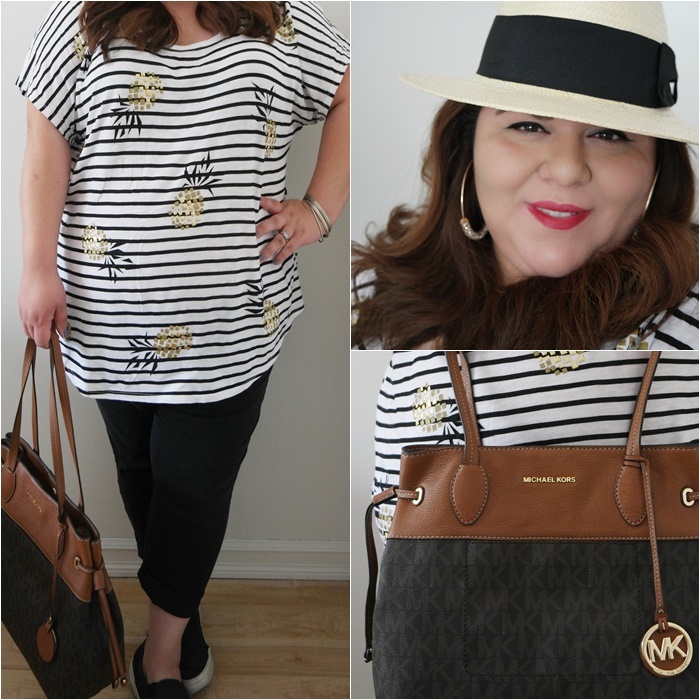 To top off my summer outfit I paired it with black cropped pants and my favorite straw hat which has seen quite a bit of action this summer, and my new MK Marina tote. Love my look? Shop them below! Have a great week lovelies!